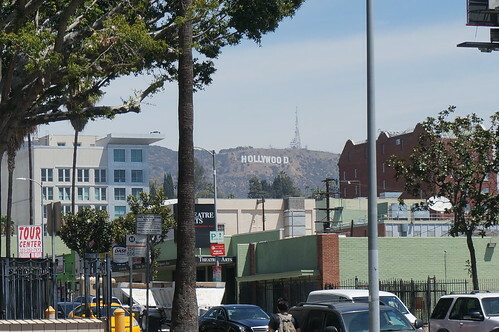 The famous Hollywood Sign from the Hollywood and Highland area. 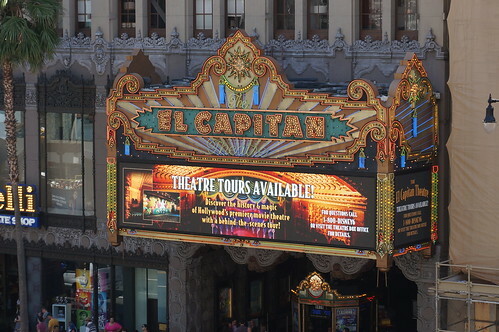 El Capitan Theatre is a fully restored movie palace at 6838 Hollywood Boulevard in Hollywood. 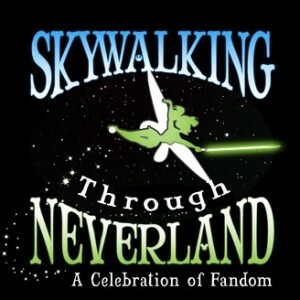 First opened in 1926 and purchased by Disney in 1989. 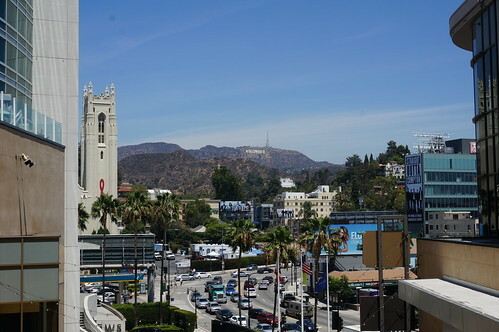 It was restored and reopened in 1991 with the premier of The Rocketeer. 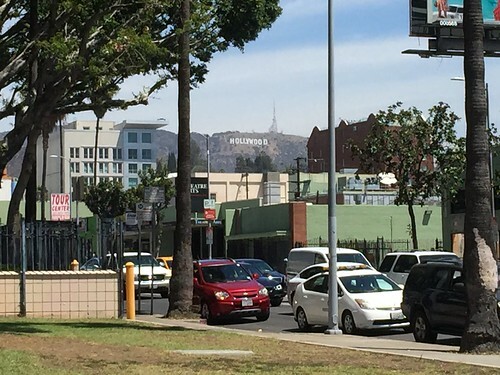 The Hollywood sign from near Highland and Sunset in Hollywood, California. 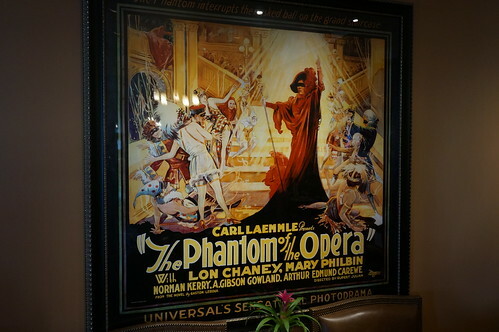 The Phantom of the Opera Poster from 1925. This poster hangs in the Universal VIP Studio tour lounge. 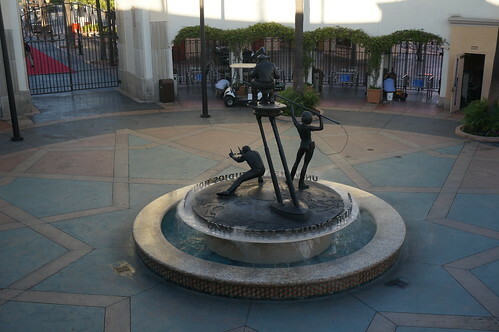 Statue of a cinematographer, sound engineer and director at the entrance of Universal Studios. 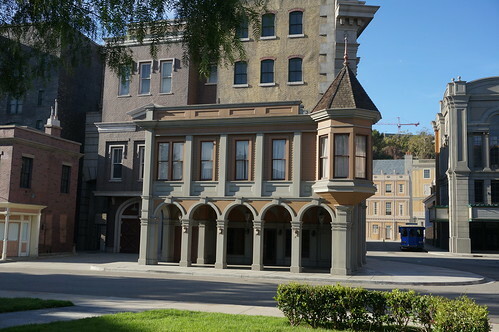 Part of Courthouse Square at the Universal Studios Hollywood. The gas station in the picture was the diner in 1985's Back to the Future. 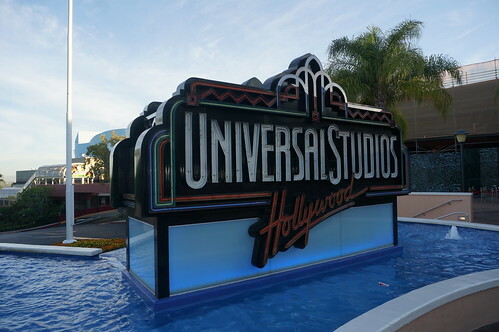 Part of Courthouse Square at the Universal Studios Hollywood. 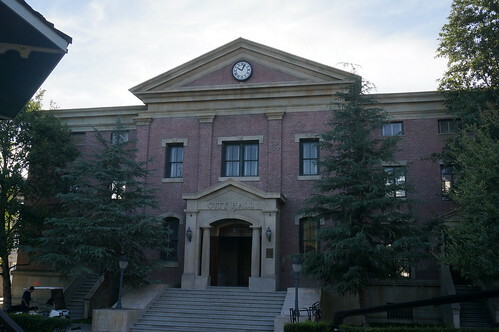 The is the clock tower from 1985's Back to the Future. The original columns are behind the false entrance. 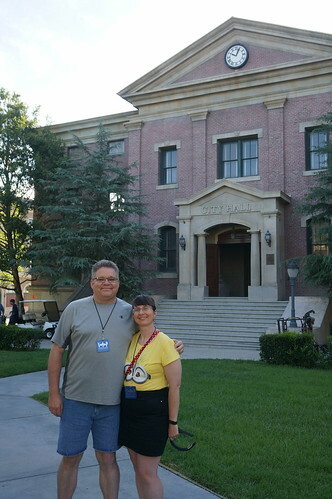 Tracey and Scott visit Courthouse Square at the Universal Studios Hollywood. 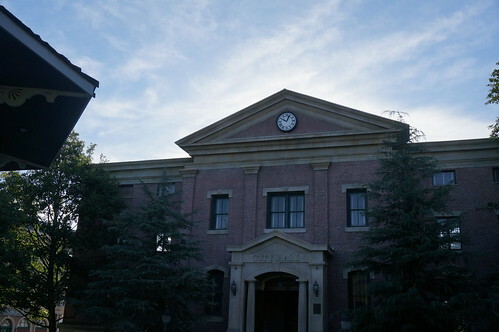 The is the clock tower from 1985's Back to the Future. The original columns are behind the false entrance. The red Ferrari 308 as seen on Magnum P.I. 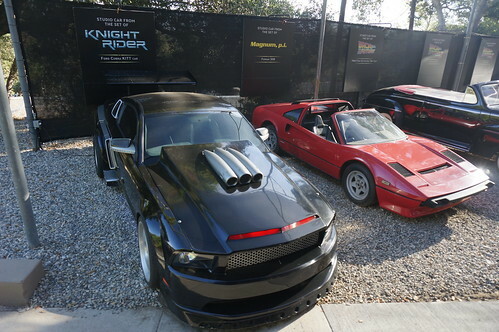 and the heavily modified 2008 Ford Mustang Shelby GT500KR was seen on the 2008 version of Knight Rider. The Gyrosphere reaches speeds of 5 mph and has a built-in computer monitor to identify the prehistoric wildlife that can be observed. To prevent harassing the animals, the vehicle will automatically roll backwards toward a safe distance if it is too close to an animal. Advanced invisible fence technology keeps the animals that are observed from roaming astray without the use of cages and bars that are unnecessary. 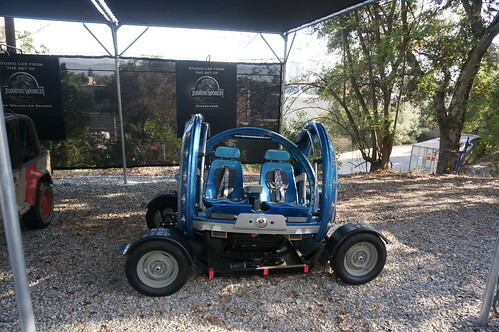 According to Jimmy Fallon in the Gyrosphere instruction video, the glass is able to stop a 50 caliber bullet and can protect the guest from the venom spit of a Dilophosaurus. The glass ball around the vehicle was added via special effects and was not actually part of the vehicle. 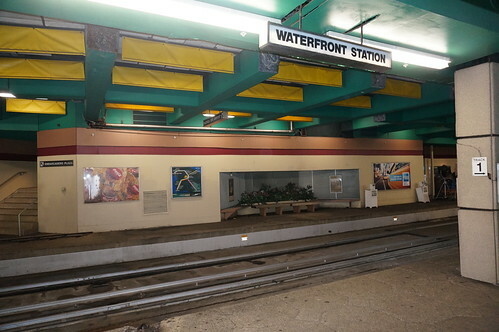 The Waterfront Station before the the earthquake strikes during the Universal Studios studio tour. 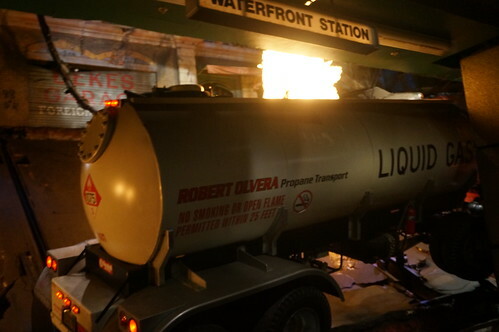 The roof has caved in and the propane transport falls into he Waterfront Subway Station as earthquake strikes during the Universal Studios studio tour. 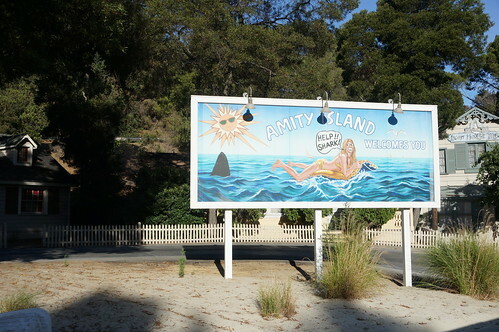 The entrance to the Amity Island section of the Universal Studios Hollywood Studio Tour. 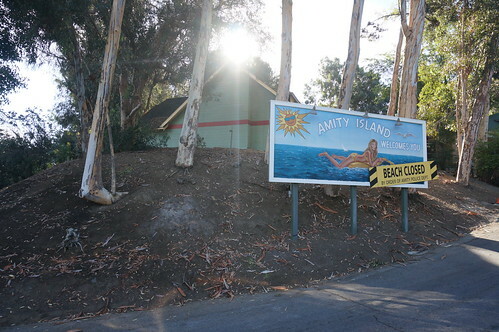 The exit to the Amity Island section of the Universal Studios Hollywood Studio Tour. Alfred Hitchock's 1960 cinematic masterpiece Psycho, although originally distributed by Paramount, was financed by Hitchcock himself, and filmed at Universal Studios using the Revue Studios television crew from Alfred Hitchcock Presents. It was filmed on a tight budget, and accordingly, the exterior sets built for the film...the Bates Motel and home...were partly constructed from studio "stock units," including in the case of the Bates home, a tower and front wall portion borrowed from an existing house set on the backlot's Colonial Street. The Bates home, or "Psycho House" as it has come be known, was built as a two-walled exterior facade, as it would be filmed only from a vantage point within a 90 degree span. 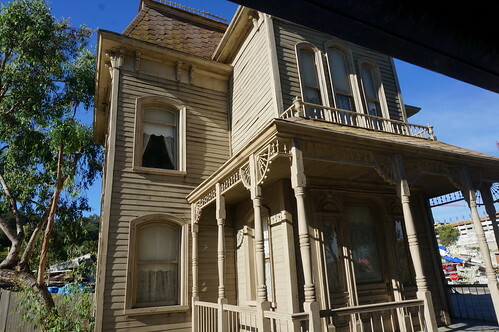 The "Psycho House" became an iconic symbol of eerieness, and has appeared in countless films (including two Psycho sequels), television shows and advertisements. 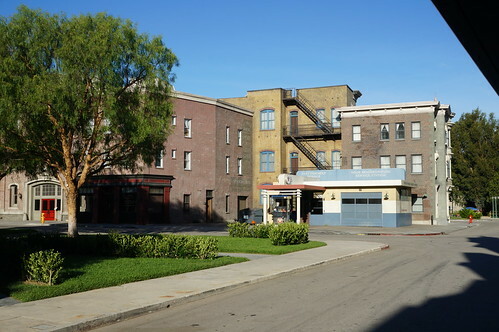 The set still stands on the Universal backlot fifty years later, although modified and twice relocated over the years. 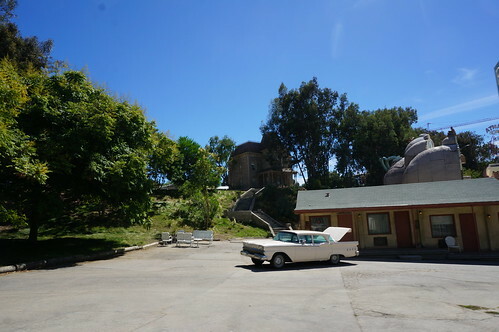 The Bates Motel along the Studio Tour at Universal Studios Hollywood.